Dental implants are the best permanent tooth replacement option available in Providence NV and the surrounding community. It hasn’t always been that way, but the technology has greatly improved in the last few decades. What once sounded futuristic is considered mainstream dentistry. A dental implant is a metal rod (usually titanium) implanted into the patient’s jaw. A crown and supporting structure are securely and permanently attached to the rod. Titanium is very strong and extremely well tolerated by the human body. There are very few instances of rejection. Dental implants are a long-term solution to tooth loss. Are you a good candidate for tooth implant surgery? Age is rarely a factor in whether a patient is a viable candidate for a dental implant. But because it is anchored to the jaw bone, it is essential that you have enough healthy bone at the implant site. There are a few medical issues that may come into play. These include diabetes, osteoporosis, radiation therapy for cancer, parathyroid disorders, bone disorders and leukemia. 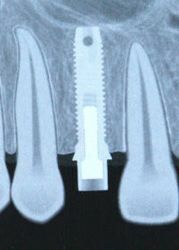 The presence of one or more of these conditions does not necessarily rule you out as an implant candidate. We’ll discuss all relevant issues during your implant consultation. Call Providence Dental in Las Vegas NV to set up an implant consultation. We also provide cosmetic dentistry, as well as family dentistry, including pediatric dental services.